There can be no life without water. I’ve heard this more than once from my scientist cousin. And of course, he’s right. Our bodies are about 60% water, more or less, and every day that we live, breathe and move, we lose the water we have. So, reasonable deduction tells us we have to replenish that which we are losing! Our bodies use water to regulate our temperature, transport oxygen and nutrients to our cells, and assist in the process of digestion, metabolism and elimination. Without water, our bodies can’t flush out waste and toxins. Not getting enough leads to dehydration; and this leads to a number of health problems, one of which can be death. Are you with me so far? Now here’s where it can get challenging for some folks. Your body needs water. Not sodas, not coffee, not alcohol, not black tea. Even though those are fluids, they may be dehydrating and make your body need more water. If you consistently deprive your body of water, you may suffer from chronic dehydration. This isn’t the same as collapsing in the desert heat while searching for an oasis, but it can definitely create some concerning health consequences including constipation, fatigue, digestive disorders, high and low blood pressure, respiratory problems, urinary infections and skin rashes. So, we need to drink water. How much? For many years, we’ve been told that we need to be drinking an average of 8 glasses of water a day. That can seem a bit daunting! More recently we are hearing our need for water changes with the amount we exercise, the food we eat, the weather, and other factors. Maybe one of the best ways to determine if you are getting enough water is to check the color of your urine. Urine is naturally pale yellow. That’s the color you want it to be. If your urine is clear, then you can cut back on your water intake. If it is darker, then you need to drink more water. Keep in mind that riboflavin (vitamin B2), which is in most multivitamins, turns your urine fluorescent yellow so you’ll need to avoid that for a day or so to get a true reading of color. Keep a bottle or a glass of water on your desk while you work - having it handy makes it easier to drink. Avoid alcohol and coffee in excess, as well as soda and sugary drinks. Squeeze some fresh lime or lemon into your water for a flavor boost. Drink pure spring or filtered water in between meals. 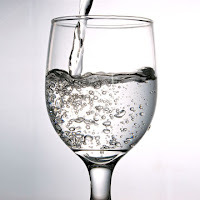 Too much water with food can dilute gastric acids making digestion weaker. Slowly sip a cup of hot herbal or green tea after a meal. This supports digestion and provides needed fluid. Make spritzers using natural sparkling mineral water, plain, or flavored, mixed with a little fruit juice. Eat whole juicy fruits and vegetables. Drink warm or room temperature water first thing in the morning to wake your system up and get things moving. Then spread your water intake out during the day to keep you better hydrated. If you have kidney problems or you take diuretics, talk to your health care professional about your individual water needs. What are your tricks for drinking enough water? I’d love to hear!